I travelled to both Osaka, Japan and Shanghai, China last month to attend SOLIDWORKS 2016 Beta rollout events. After the Japan event, was I ready to tackle another week in yet another country? Well, yes. I was already adjusted to the local timezone in Japan, so the one hour difference between Japan and China didn’t phase me. Since I was in town a day early, I was able to meet up with the SOLIDWORKS China team and visit a customer to talk about how we can improve SOLIDWORKS to better meet their needs. The Product Definition team conducts over a hundred of these vists each year. It was great being able to visit one of our valued Chinese customers. Each day of the Beta rollout in China was a complete event for its attendees. In the morning, SOLIDWORKS China team presented the What’s New and explained the SOLIDWORKS Beta testing. For the rest of the day, attendees eagerly tried out SOLIDWORKS 2016 on their own models and designs in our lab. Day one of the event focused on customers interested in SOLIDWORKS core, including assemblies, parts and drawings. Understandably, this was the largest group of the event. The SOLIDWORKS team visiting from Waltham had a great opportunity to connect with our customers in China. 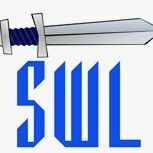 We got a lot of great feedback about SOLIDWORKS 2016. Days two and three of the event focused on customers interested in such topics as SOLIDWORKS Electric and SOLIDWORKS PDM. 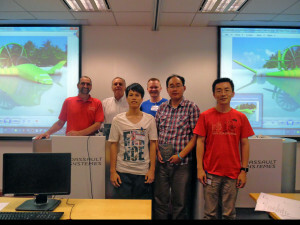 Each day of the event, SOLIDWORKS China recognized the most prolific bug finders of the day. 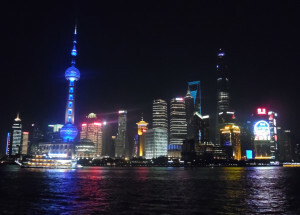 In the evenings, those of us from out of town explored the iconic areas of Shanghai on foot. 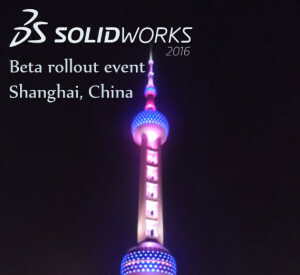 The Shanghai SOLIDWORKS 2016 Beta rollout event was great. Interacting with our customers as they are using SOLIDWORKS 2016 for the first time provided a lot of valuable feedback. A big thank you to our SOLIDWORKS China team for hosting this event!